There is so much to do at DePauw! Get Involved! 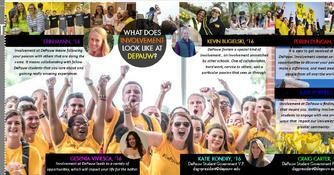 DePauw is committed to enhancing the overall educational experience of all DePauw students outside of the classroom. We provide and promote a wide range of resources and social opportunities that are student centered. We support students' personal growth and promote a social life that is consistent with the intellectual life of the institution. If you are looking for something to do on the weekends, there are a variety of campus activities for you! Campus Activities provides late night programs on weekend nights and food truck events. A student-run club, Union Board, hosts big concerts on campus, and events during new student orientation. All DePauw students are involved in various student organizations; ranging from academic to social, athletic clubs to performance groups, and service and philanthropic. Explore and engage in the many opportunities on campus. Check out all the amazing student organizations and performances from the 2015 Student Organization Showcase & Community Service Fair! Register Your Organization's Event Today! 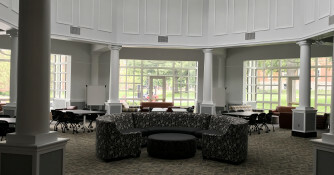 Student organizations can reserve the new Campus Living Room space for events on Friday and Saturday nights! Click on the link below to reserve your time today!